You love that morning coffee and are just tired of looking at expensive, exclusive outlets for that perfect cup of blended latte. Solution – be a home Barista! The cost of some of the best latte machines is really not that high, in fact, it is affordable, and you get the love and admiration from your friends and family. ​If you just cannot function without this Italian brewed concoction of espresso and steamed milk, then you are absolutely in the right place to track down the best latte machine, so that you get that steaming cuppa at your convenience and disposal. But before talking about the best latte and espresso machines, let’s get your doubts about them cleared. Is There a Difference Between Espresso and Latte Machines? There is a range of coffee machines in the market with a range of confusing names, and surely the above question about the difference amongst them must have sprouted in your mind. ​The first fact to know here is that an Espresso machine is really just a versatile machine that can be used to brew all types of coffees that you like to have. They can be used to make the best latte, cappuccino, Americano, etc. with the addition of a tool or two in some cases to take a healthier step in the direction of weight loss with coffee. ​A latte is basically an espresso shot mixed with steamed and frothed milk. Simply put, a latte machine is an espresso maker combined with a milk frother. So, if you exclusively are looking for a way to furnish yourself with freshly brewed lattes, then go for an exclusive latte maker. ​However, if variety is your style and you really want to invest smartly, then all you need is an espresso machine, and you could steam the milk separately to pour over your fresh shots of espresso. 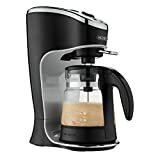 There is an entire spectrum of coffee makers that has on one end some inexpensive semi-automatic coffee machines and some super sophisticated automatic coffee machines on the other. You may have the best Hawaiian coffee or Kona coffee at your disposal, but what you also need is some barista skill to brew that perfect coffee shot. This is where the super-automatic espresso and latte machines step in to make your job simpler and help you make delicious coffee at the press of a button. This help recreates some of the café magic at home at slightly escalated prices but makes your work a piece of cake. On the other hand, semi-automatic latte machines will help you save some money, but your tamping and frothing skills need to be great since these become manual tasks. Moreover, if you are looking at perfecting your art of latte art, then semi-automatic is probably the way to go. You can also learn about the art of latte in more detail here. Space and cleanliness will play a significant role in deciding the sustainability and longevity of your newly bought best latte machine. If multiple cups of coffee are on the horizon, then that calls for a lot of thorough cleaning. The time consumption and efforts required in this cleaning process will highly depend on the model of the latte machine that you purchase. ​Quick, programmed self-cleaning modes are available in most automatic coffee machines, whereas, semi-automatic ones require to be cleaned after every use to ensure that your next drink is as perfect as the first one. You can learn more about cleaning your latte machine here. ​Also, if you happen to own a Keurig coffee maker, you might probably share the problem like other Keurig owners. If you Keurig break down, perhaps this post - Common Keurig Coffee Maker Problems and How to Easily Fix Them might be able to help you. ​Now, let us now have a brief look at some of the best latte machines in today’s market. Get coffee ready and on the go with the Nespresso Pixie espresso machine which comes with state-of-the-art programmable buttons and pre-programmed modes. The machine is small enough to fit into the tiniest of kitchens and provides great quality espresso in as little as 25 seconds. The brews are full of flavor with this coffee maker that comes with an Aeroccino Plus to froth hot and cold milk in just 60 seconds for your favorite cappuccino and lattes. The Nespresso knows how to save power and your efforts with its auto power-off feature, its backlight indicators and water level detectors. Even a lungo can be prepared in under 30 seconds! The design is sleek and compact, and barista level results are achieved thanks to the 19-bar pressure pump. Along with the promise of a deliciously brewed cup each time, you also get 16 Nespresso capsules with your purchase which will ensure that your café lattes are exceptionally aromatic. The entire coffee machine weighs just 2.8 kg and comes with a removable water tank and foldable drip tray. We highly recommend the Nespresso as the best latte machine out there. The best way to make café latte and café au lait at home is through the second best latte machine on our list – Mr. Coffee Café Latte. The most significant advantage of this coffee machine is its incredibly powerful milk frother which works at 120V. You can easily prepare more than one serving of any milk-based coffee that you like and can also use it to prepare steaming cups of hot chocolate! This coffee maker is the number one automatic one-touch latte machine in the market at the moment and is your best bet if you are looking for an exclusive latte machine. The disadvantage is its insufficiency in making espresso shots. Mr. Coffee gives you the power to be your own barista at home with a 20 coffee recipe booklet that comes with this purchase. You can literally have café-style brews at your home in under 3 steps and 1 minute. This coffee maker is astonishingly simple to use and clean too – all you have to do is pour out the contents of the latte pitcher and wipe the outsides with a damp sponge. It also weighs just 8.7 pounds, and you can use any type of milk for your aromatic coffee breaks! The De Longhi Lattisima is a capsule-based espresso maker, which, as the name suggests, is a specialized latte maker and is one of the best latte machines. It comes with an automatic milk frother and is ready to prepare your favorite cappuccino and latte brews in just 40 seconds. This is the most versatile coffee machine which is not only perfect for lattes, but also for making a macchiato, cappuccino, and espresso. With just a touch of a button, you can prepare a range of beverages with the De Longhi. The coffee machine is highly easy to use, and you can even personalize, save and pre-program your favorite recipes and selections. The removable water tank, sliding drip tray and capsule container makes it surprisingly easy to clean too. The machine features an automatic power saving timer and weighs just 11.9 pounds. The design is very classy and appealing to fit and compliment every kitchen that it becomes a part of. What we also love about this brewer is the self-cleaning feature and the self-ejection of used capsules into a used capsule tank, and thus, give it the third spot on our best latte machine list. 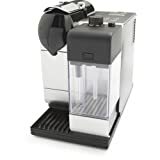 We go through hundreds of products listing at Amazon and also study the ratings left by previous buyers to find the best latte machine for you. Besides that, we also calculate the overall n﻿﻿et ﻿c﻿﻿ustomer﻿﻿ satisfaction (NCS) grade because we want to see how happy is the previous buyers with their purchase of the product. From our finding, we can say that Nespresso, Mr. Coffee and DeLonghi are the best latte machine brands. These brands are popular and received many excellent ratings for their products. Also, the Nespresso Pixie, Mr. Coffee Café Latte and De Longhi Lattisima score favorably for the ratings as well as the NCS grade compare to the rest. We believe that you would find these latte machines a good buy too. Our absolute favorite, and therefore, the most highly recommended best latte machine is the Nespresso Pixie Coffee Maker. 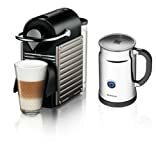 ​It packs a punch and it is amazingly simple and convenient to make barista-style café latte and other coffees in the tiniest of home kitchens at reasonable prices. We hope that our list and compilation of hacks helped you in knowing your best latte machines better!